The cowboy is an American icon. Riding the range and herding cattle, cowboys have long represented the American ideals of independence and autonomy. As our culture and economy have changed over the last couple of centuries, the number of ranches in the American West has been dwindling, and cowboys are becoming increasingly rare. 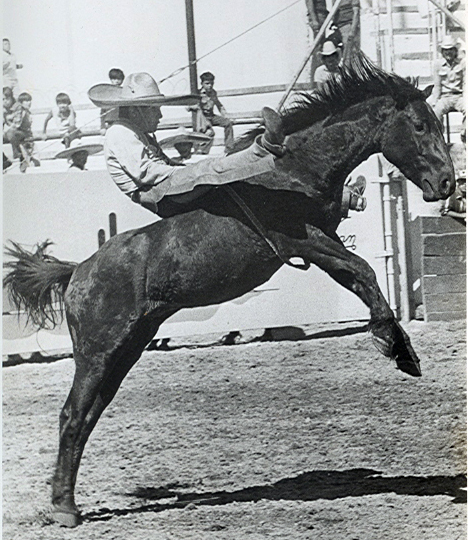 Rodeos are one of few remaining ways that most people have access to ranch/cowboy culture. 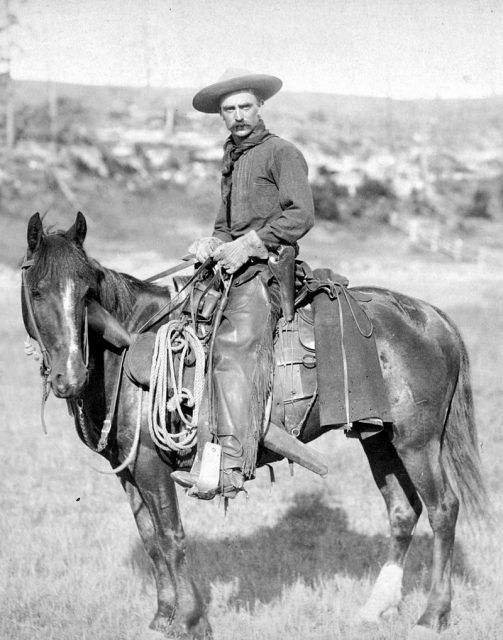 The cowboy, the quintessential symbol of the American frontier, c. 1887. According to the Texas State Historical Association, rodeo as a sport can trace its roots back to the sixteenth century, when Spanish Conquistadors and Spanish-American settlers first introduced, and began breeding, horses in the American southwest. In the 1800s, the American push for westward expansion was well underway and brought American settlers in contact with Spanish ranchers and vaqueros, who had a strong influence on shaping the practices and traditions of new, American ranches. 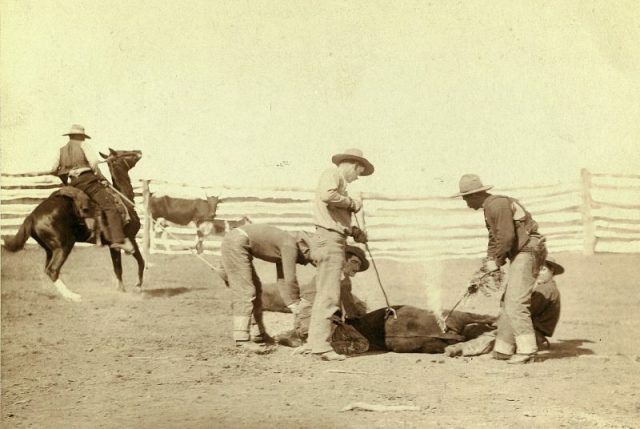 Branding calves, 1888. 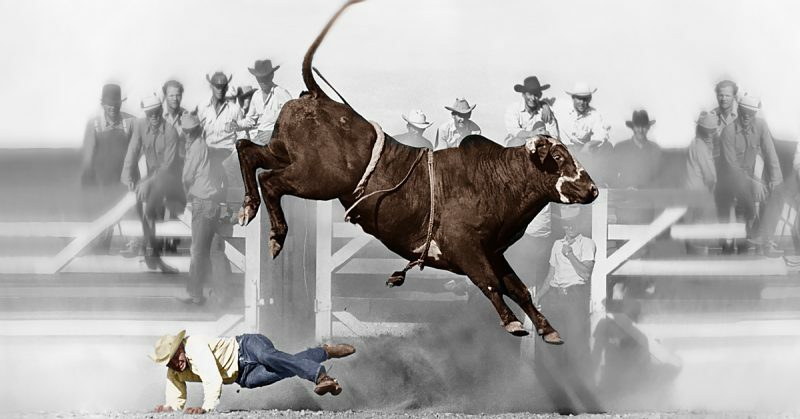 Many rodeo events were based on the real life tasks required by cattle ranching. After the end of the Civil War, when there was an abundance of wild cattle in the west, and a large and increasingly populated market in the east, is when the real era of the American cowboy began, with its long cattle drives and big ranches. Modern rodeo events revolve around skills that those range cowboys used in daily life. The Spanish influence is felt in the nature of some of the events, like roping and branding. A lot of a rodeo cowboy’s traditional equipment has its roots with the old vaqueros (cowboys), such as the ropes they use, the spurs, their chaps, and the style of saddle. Even the word rodeo (meaning “roundup”) demonstrates the Spanish influence on the culture. 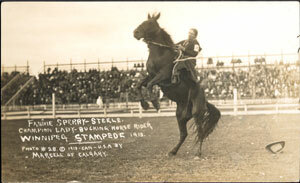 Fannie Sperry Steele, Champion Lady Bucking Horse Rider, Winnipeg Stampede, 1913. By the late 1800s, the expanding railroad system and barbed wire fencing put an end to the range-cowboy era, according to ThoughtCo. As the railroad came closer to the ranches, and the range became increasingly subdivided, there was no longer a need for long cattle drives. The western territories were becoming increasingly settled, with more farms and towns springing into existence all the time. As a result, the work for cowboys was diminishing. They took work where they could, and for a number of them, that meant joining “Wild West” shows. 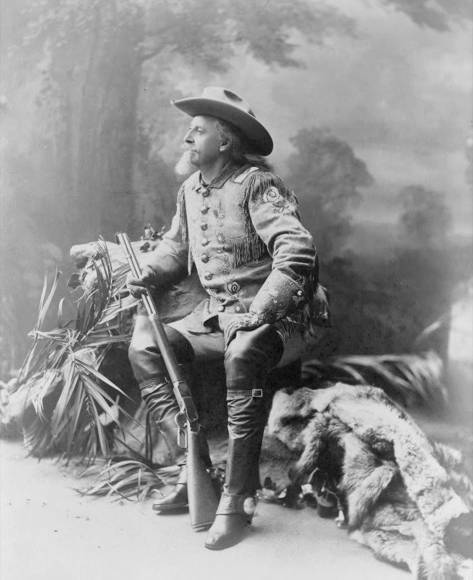 These shows were a phenomenon created by people like Buffalo Bill Cody, full of competition and flash. They were a way of romanticizing and preserving the memory of the western frontier, as well as generating money. Cody wasn’t the only one to take hold of the idea. There were other, similar shows, like Pawnee Bill’s Wild West Show, and the 101 Ranch Wild West Show. 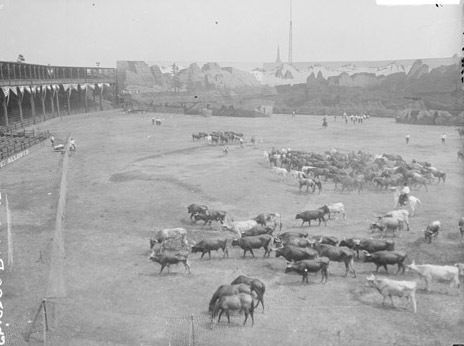 West Side Park as configured for Buffalo Bill’s Wild West Show. The shows all cultivated a flair for pageantry and showmanship as a means of attracting customers, and those are both still very present in today’s rodeos. In fact, they’re often referred to as Rodeo Shows, and the participants are often called performers. 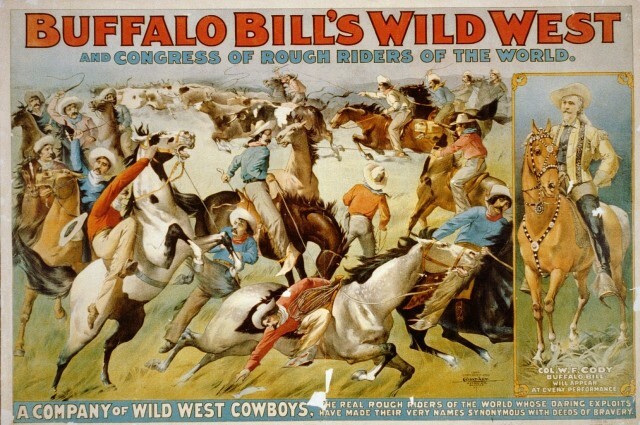 Buffalo Bill’s Wild West and Congress of Rough Riders of the World. The cowboys who didn’t join shows often bolstered their incomes by taking part in informal competitions which became open to paying spectators. 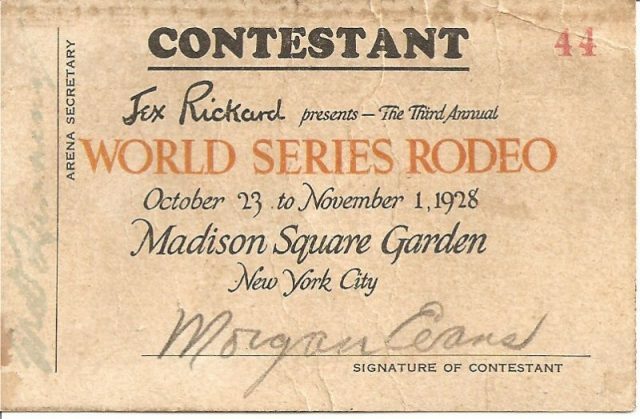 Second Annual 1928 World Series Rodeo (Steer wrestling Champ 1927) Contestant ticket. Of the two varieties of the show, only the rodeos would last. The Wild West Shows were very expensive to put on and maintain, compared to the competitions, and the joining of those competitions to the stock horse gatherings would turn into what we now recognize as modern rodeo. Bulldogging photo of Cowboy Morgan Evans at the Tex Austin rodeo in Chicago (notice that Cowboy Evans has a Western riding boot on his right foot and a low quarter shoe on his left for quick competition dismount. 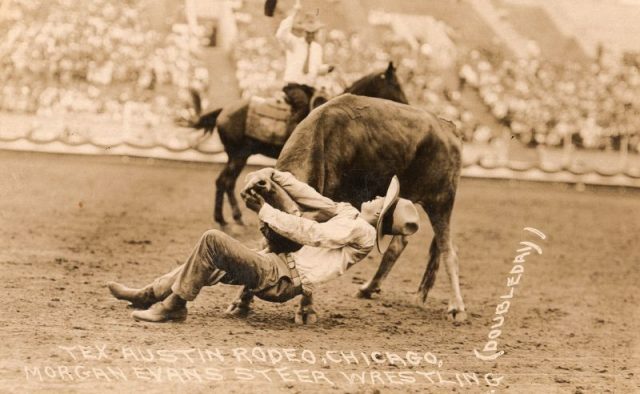 Rodeo as a sport had a few growing pains, though. One of the issues was that a number of early rodeos billed themselves as World Championship Rodeos, meaning that sometimes not only were there several different cowboys at a time who all claimed to be the World Champion but sometimes there was more than one of them at the same event. Given that, in its earliest days, rodeo was treated mostly as an entertainment by its producers. It needed to cultivate a more formal image as a sport. By the 1920s, attempts to organize were underway. The Rodeo Association of America was organized in 1929 by several rodeo committees, with the purpose of making consistent standards, rules, and point systems to determine champions. They also monitored judges and business practices around things like awarding prize money or advertising practices. American rodeo has become a popular sport/entertainment, but, unlike many sports, the rodeo had its roots in real life work and the influence of another culture.